Soji Oye, Abuja: Following the directive of the Hon. The Chief Justice of Nigeria and Chairman of the National Judicial Council, Hon. Mr. Justice W. S. N. Onnoghen, GCON, to the Heads of Court to compile and submit a compendium of all corruption cases being handled by their various jurisdictions. 1, 124 (One Thousand, One Hundred and Twenty-nine) corruption cases have so far been received from the various jurisdictions across the country. This fact was revealed today by the Chief Justice of Nigeria at the formal inauguration of the Corruption and other Financial Cases Trial Monitoring Committee (COTRIMCO) at the Complex of the National Judicial Council. Hon. Mr. Justice Onnoghen, GCON, said the Committee was formed as part of the commitment of the Judiciary to lend support to the efforts of the present regime, to rid the nation of corruption. He promised that all aspects of judicial duties would be scrutinised, improved and re-aligned towards reform. He explained that all the institutions of the Judiciary and Heads of all the Courts have been advised to provide the Committee with all the necessary information and support to enable the Committee make decisions from informed perspective. He noted that Hon. Mr. Justice Ayo Salami should have headed the Committee but withdrew on personal ground. He hoped that the respected Judicial Officer will be available for other national judicial assignments in the near future. He paid tributes to the Members for accepting to serve their fatherland through this assignment inspite of their numerous other engagements. The Hon. The Chief Justice of Nigeria explained that the choice of the Members was purely on merit and recognition of their track records of service to their fatherland, as well as contributions to the development of the country’s law and jurisprudence. He implored them to come up with strategies that will help eliminate the delays and its attendant effects on the speedy disposal of corruption cases. He advised the Committee to do all it can to justify the high level of public confidence reposed in it. 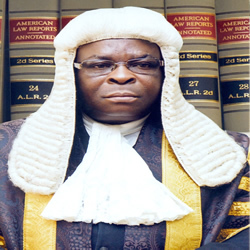 The Committee is expected to among other things propose Practice Direction, for consideration and approval of the Chief Justice of Nigeria, in order to compliment the Administration of Criminal Justice Act (ACJA) and serve as a guide to as well as applicable Rules in all Courts designated for corruption cases. He advised the prosecution and defence counsel to shun all unethical antics employed to delay hearing and determination of corruption cases as Heads of Courts have been directed to report such counsel. He added that such counsel will be referred to the Legal Practitioners Privileges Committee (in the case of a Senior Advocate of Nigeria) or the Legal Practitioners Disciplinary Committee (in the case of other Legal Practitioners) for staff disciplinary measures. Responding, the Chairman of the Committee, Hon. Mr. Justice Suleiman Galadima, CFR, on behalf of the Members expressed his appreciation to the Chief Justice Nigeria for inviting them to serve the nation. He assured him that the Members would bring to bear their wealth of experiences to ensure the purpose for which the Committee was set up. He pledged that the Committee would strictly adhere to the Terms of Reference. The inaugural Meeting of the Committee was held immediately after they were sworn in.